Northumberland is the ideal location to see wildlife. We have the beautiful coast, National Park and the North Pennines to explore, which are packed to the brim with rare plant and animal species. Not only are there animal sanctuaries you can visit, there are wildlife tours and boat trips all down the coastline, so you can explore the best of wildlife in Northumberland. The Sanctuary Wildlife Centre at the little village of Ulgham just outside Morpeth is probably the largest wildlife rescue centre in the north-east of England. Currently home to over 150 animals, The Sanctuary cares for injured and abandoned British wildlife as well as many unwanted farm and pet animals. They can only accommodate visitors in groups of 6 or more, so unless you’re a larger family you won’t be able to visit here. You can feed the wildlife in care, feed the farm animals, handle and care for the more exotic animals and much more. Animals range from foxes and donkeys to tortoises and tarantulas! There is a tearoom at the sanctuary and disabled access. No dogs except guide dogs. The Eshott Heugh Animal Park is a small, family run park situated just off the A1 road, just 5 miles north of Morpeth and really easy to find. The small animal park has animals such as donkeys and miniature ponies, to chincillas, budgies and hamsters. They are a rehoming shelter which is open to the public, where you can also feed some of the animals. There is a small tea room at the park, along with a pretty little gift shop. Northumberland is a wild and beautiful county and home to some of the most treasured wildlife in the UK. Blyth Wildlife Rescue is an amazing and incredibly dedicated wildlife rescue service working right across Northumberland, dealing with over 1,000 requests for help every year with the help of over 20 dedicated volunteers. We’re passionate about animal welfare and protection, so we’re pleased to donate £1 from every holiday booking we take throughout 2018 to Blyth Wildlife Rescue to support them in the amazing rescue and rehabilitation work they carry out every day across Northumberland. Please take a minute to find out more and, if you can spare just a few pounds a month – the price of a cup of coffee or glass of wine – a regular donation is very easy to set up and will help them enormously. A family friendly working bee farm, with a great visitor centre from which you can learn and observe the foundations of the work. A most popular display is the observation hive where a live colony of bees can be viewed behind glass. As well as visiting the farm, in their shop you can buy everything beeswax! Whitehouse Farm Centre provides fun days out for children and families enabling visitors to see, handle and feed a wide variety of animals from traditional breeds to unusual and exotic species. This Farm is much larger and plays host to much more animals such as rare breeds of pigs and sheep, to crickets and cockroaches. A must day out! Northern Experience Wildlife Tours offer exclusive, guided, birdwatching, photography and wildlife tours, holidays and tuition, based in Northumberland, the North Pennines and the Scottish Borders. Specialising in Safari Days, Prestige Tours and Bespoke Experiences of the Cheviots and Lindisfarne, these tours are perfect for anyone that takes a real interest in wildlife as you can experience one to one tuition, and also family events. Children will love the experience of spotting wild animals and they even offer a whale and dolphin cruise! The wild cattle at Chillingham Castle are the only wild cattle in the world, and are even rarer than any endangered panda or mountain gorilla. They are survivors of herds that once roamed the forests of Britain, once held sacred and pre-Christian pagans sacrificed them to their gods. The warden of the castle will take you as close as possible and explain their more recent history and way of life. You can also take a tour of the ghosts of Chillingham Castle walking through the haunted rooms searching for The Blue Boy and Lady Mary Berkeley! Open April to October. The Farne Islands lie 2 to 3 miles off the Northumberland Coast, midway between the fishing village of Seahouses and the magnificent Bamburgh Castle. As well as being the most famous Sea Bird Sanctuary in the British Isles, they also have a large colony of Atlantic and Grey Seals. The cruises run from April to October and more information can be found on the harbour in Seahouses, or on the Farne Islands website. Holy Island or Lindisfarne is known as the “cradle of Christianity”. This excellent unforgettable trip lasts 4 hours including the 2 hours spent on the island, and commentary is given en route. Leaving Seahouses, it sails around Inner Farne viewing many nesting sea birds and visit the Grey Seal colony at Megstone, before sailing up the coast to Holy Island. Two hours are spent ashore, allowing time to explore this historic island. Popular places to visit are the Priory Museum (English Heritage), Lindisfarne Castle (National Trust), St Aidan’s Winery (where a free sample of mead can be enjoyed), and the Museum of Island Life and Visitor Centre. Holy Island also has several cafes, pubs and shops. Please visit the Billy Shiels website for more information, or visit the harbour at Seahouses. Coquet Island is a sea bird paradise situated about a mile from Amble Harbour. The island is home to 40,000 nesting sea birds such as Puffins, rare Roseate Terns, Kittiwakes and many more. The boat trip operates from Amble harbour at the dock steps, and the boat trip lasts for one hour, sailing out around the Coquet Island, viewing the rich sea life. Booking is definitely recommended. Dave Gray’s Puffin Cruises. 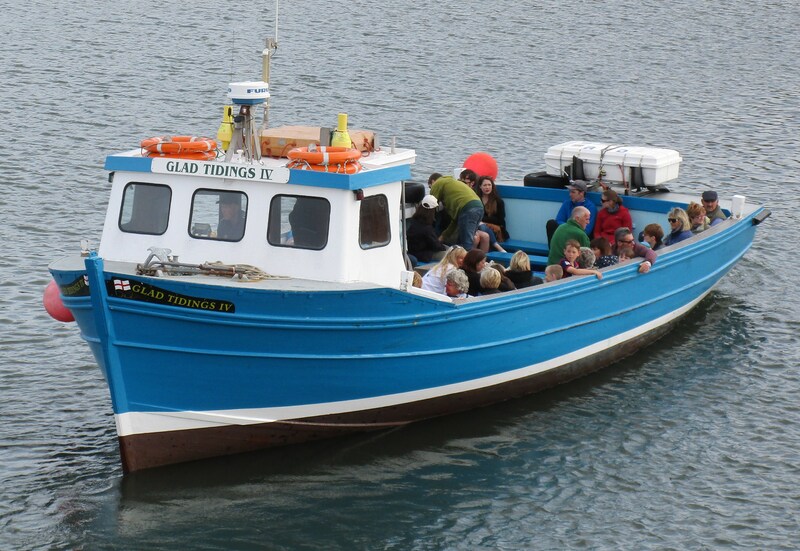 The most popular place for boat trips to depart from is the harbour of Seahouses. As well as the boat trips mentioned above, there are many more cruises on offer, some specifically for types of species and coastline. Please visit the Farne Islands website for more information of what’s on offer. Need a little help booking? We know Northumberland incredibly well and all of our cottages inside out, so if you have any particular queries, please don’t hesitate to call or email us. We’re more than happy to help!